This time last year, players, officials and crowds were trying their best to deal with a +40°C/105°F heatwave that lingered over Melbourne for most of the Australian Open’s first week. One year later, and things have changed. While Margaret Court Arena now features a roof to guarantee play on three courts come hellish temperatures, tournament director Craig Tiley has also amended some of the tournament rules that govern its Extreme Heat Policy (EHP). But how do they differ from those of the past? And will they even matter this year? TTI’s #rulez expert Victoria Chiesa and resident weatherman René Denfeld take a closer look. René Denfeld: When Stan Wawrinka and Li Na lifted the trophies at the end of the 2014 Australian Open, a fortnight full of upsets and intriguing tennis had come to its dramatic conclusion. But during the first five days, it wasn’t necessarily the tennis itself that made headlines. With temperatures well into the triple digits of the Fahrenheit scale (or above 40°C), the continuation of play through extremely hot conditions sparked controversy among media, athletes and officials alike. Adding fuel to the fire, tournament doctor Tim Wood proclaimed that playing conditions were safe. …While players were fainting and vomiting on court. But during four consecutive days of extreme heat in 2014, the existing Extreme Heat Policy was only put into effect for one afternoon. What do you make of the way conditions were handled one year on, Victoria? Victoria Chiesa: Looking back on the events of a year ago, even I have to say that what transpired didn’t paint the tournament in a favorable light. Rules that are left up to an official’s discretion are often a source of constant criticism, and while we all know that I’ll be the first to crack open the rulebook and shed some kind of light on it, this was an instance where I felt that the criticism was warranted. When anything from our sport leads the evening edition of SportsCenter, I’d normally be proclaiming #tennisisalive. Nobody won in this situation. The players certainly didn’t, for obvious reasons. But neither did the fans, ball kids and on-court officials. You can’t run, hit a tennis ball, catch a tennis ball, or decide whether a hindrance was deliberate or not in weather that’s approaching 110°F. It was uncomfortable and dangerous for spectators, too. The powers that be looked like they didn’t know what they were doing, that they didn’t have the best interests of all parties involved in mind. RD: It really didn’t benefit anyone, and it certainly cast a somewhat dubious spotlight on a tournament that prides and promotes itself on being the “Happy Slam.” Weather Models such as the GFS had firmly run with an extreme heatwave for New South Wales a week in advance to the Australian Open, yet it felt like the people in charge were surprised by one extraordinarily hot day after another. There was a certain sense of complacency with regards to the weather challenges. For all the criticism, the most scathing comments came from former tournament director Paul McNamee, who called the reluctance to activate the policy “irresponsible” and suggested some ulterior motives for it. After taking some considerable heat (excuse the pun) for the way things were handled in 2014, there have been some changes to the extreme heat policy for this year. Can anyone say traffic light? VC: Reported by the Herald Sun, if there is traffic light system now in place, it’s genius in its simplicity. It reminds me a lot of the system that’s in place at Wimbledon which mobilizes the grounds crew; the team there operates on a ranking system of 0-6 when determining when to cover, inflate, deflate and dress the courts for play. Half a world away, this new system for Australia’s weather-based enemy is similarly straightforward; play on when it’s green, prepare yourself accordingly when it’s yellow and break out the ice vests when it’s red. When the temperature reaches the red level, play could be suspended. If play is suspended, play will stop on the outside courts when the match reaches an even number of games, and/or when a tiebreak is completed. RD: I like the fact that there seems to be a visible system to alert athletes along with the crowd – nearly 1000 people had to be treated for heat exhaustion on Day 3 of last year’s Australian Open – and warn them of difficult conditions. I’m also glad play will be stopped before a set is completed; you’ll remember that Karin Knapp and Maria Sharapova continued playing for another two hours even though the referee had stopped play around the courts one year ago. But beyond this, the Australian Open organizers increased the temperature threshold and the Wet Bulb Globe Temperature threshold to with regards to when play may be discontinued, at the discretion of tournament referee Wayne McKewen. VC: Indeed. McKewen can now decide to invoke the police once the temperature exceeds 40 degrees Celsius (104 degrees Fahrenheit) and the Wet Bulb Global Temperature exceeds a reading of 32.5°C. Rules are my thing. This I get. Here’s what I don’t get. What is a wet bulb? RD: It sounds weird, doesn’t it? This is a wet bulb globe thermometer. It measures not only temperature, but also solar radiation, relative humidity, and wind. As a result, the temperature determined resembles the stress heat and humidity causes on the body, closer than just the absolute temperature. Calculating this temperature can be a pain. 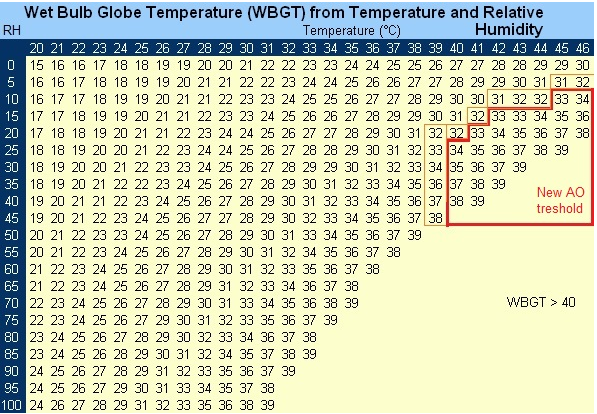 Hence, the Australian Bureau of Meteorology provide a nifty chart that lets you figure out the WBGT quite easily. I have included the updated threshold temperatures (from 35°C to 40°C) and WBGT threshold (from 28°C to 32.5°C) in said chart to give an idea when the referee is at liberty to stop play with the updated rules. As you can see, play may still be continued if it’s 45°C/108°F, as long as the air is relatively dry – precisely last year’s conditions. VC: That’s a lot of numbers, and while this is a nifty chart, I still have many questions. To try and break this all down, I guess I’ll start with the two most pressing ones. First: why would the threshold have gone up 5°C? That seems counterproductive to me. And second, what makes humidity the enemy of tennis tournaments (and Petra Kvitovas) everywhere? This is a question I also have when sitting on Court 10 in Flushing Meadows in mid-August. RD: Clarified and streamlined, right? If they increased the thresholds and used them as a benchmark – thus removing “the referee’s” discretion in all of this – I would have seen the point. But as it stands, they just raised the thresholds and the decision to stop play remains borderline arbitrary. High humidity messes up the perspiration system, which is the body’s main cool-down mechanism. And the higher the humidity, the slower perspiration evaporates from the skin, so the body has to work extra hard to rid itself of excess heat so to speak. Which is why the humid conditions at Hopman Cup (and New York last year) are so exhausting. Speaking of exhausting – the 10 minute heat-break is still reserved for just the women. Any thoughts on that? VC: This is something I don’t have the answer to. The only reason I could envision is that, when the women are given a heat break, there’s some kind of light at the end of the proverbial tunnel. After the players split sets, it’s a best of one set shootout, so to speak. With the men playing best-of-five, when do you take the break? After the second, third, fourth? Should there be a second break if a match extends deep into the fifth? I’ll admit that this really isn’t a very good reason at all, but it’s the only one I could come up with. RD: It’s a tricky one and while I think the men should be allowed a break during extreme conditions, too, it’s difficult to determine when exactly that should occur just as you said. Let’s just cross our fingers that we won’t get too many days when this special rules will be necessary. It looks like the first week at least should see moderate temperatures and the occasional shower of rain. And if not – you know who to blame, right? What are your thoughts on extreme heat? Do you agree with the new rules set forth in Melbourne?